The School of Law’s Internal Moot Court Competition, kindly sponsored by A&L Goodbody solicitors, took place on Wednesday 6th and Thursday 7th February 2019. The preliminary rounds were judged by Sinead Eaton, Hope Davidson, Dr Margaret Fitzgerald O'Reilly, Eoin Quill, Professor Paul McCutcheon, and Dr Norah Burns. All judges commented on the high standard of mooting displayed by students throughout the preliminary rounds. The Grand Final of the competition took place at 5.30pm on Thursday 7 February in the Appeal Court, Glucksman Library. The Grand Final was adjudicated by Dr Stephen King (A&L Goodbody Solicitors), Prof Raymond Friel (UL) and Sandra Barnwell BL. Congratulations to the winning team of Jemima Nugent and Norah O'Brien (counsel for the appellant) and to the runner up team of Jack Hennessy, Alex Casey and Cian Cremins (counsel for the respondent). The Best Speaker prize was awarded jointly to Jemima Nugent and Norah O'Brien. 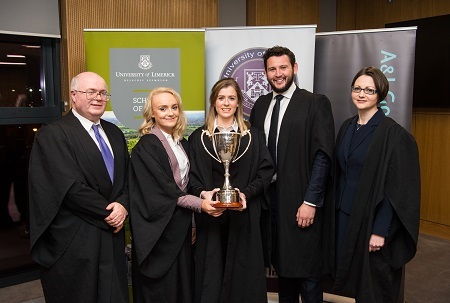 The moot court competition was organised and co-ordinated by Dr Lydia Bracken, Director of Clinical Legal Education at the School of Law, and Niamh Walshe, UL Law Society Mooting Officer. The Grand Final was followed by a prize giving and reception in the Appeal Court.